I am the first to admit that "commercial" blogs rarely work. Anyone who actually blogs on a regular basis know that a blog grows out of the things the blogger loves and that kind of love rarely seldom translates to that commercial level. 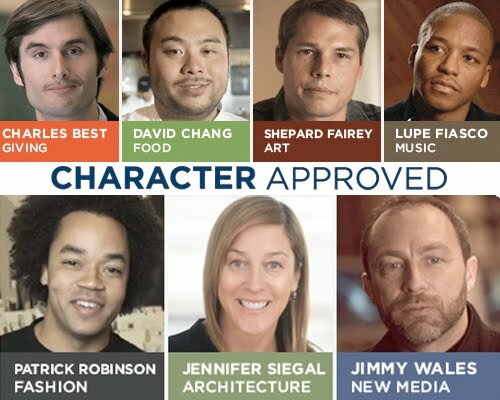 USA (the Network) has recently started a blog based on their ad campaign "Characters Welcome." Since USA's prime time offerings feature some fairly strange characters, they set out to celebrate the characters in everyday life. Last year and this year, they have selected a group of "characters" who are celebrated in their field. For the most part, their choices are already celebrated - chef David Chang, director Kathryn Bigelow, designer Narciso Rodriguez, and artist Shepard Fairey to name a few. They are a bit different in that they have a category for giving, which features a humanitarian or philanthropist. It is nice to see that component amid the the art , food and movies. Several months ago, USA launched a web site, The Character Blog, featuring architecture, art, design, fashion, film, food, music, technology, writing and social giving. They enlisted a bunch of blogger to actually write the stuff, so I am hoping it will be interesting.